Sotheby's "Fairchild Paperweight Collection Auction Catalog"
Sotheby's "Important Paperweights from the Collection of F. Regnault and Frances C.D. 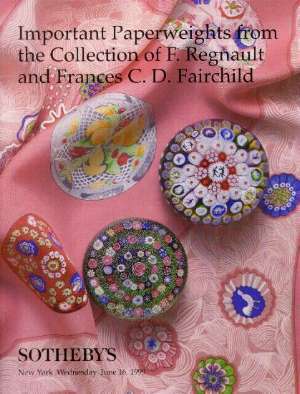 Fairchild (New York, June 16, 1999)"
Fabulous catalog from Sotheby's recent sale. paperweight from each lot. 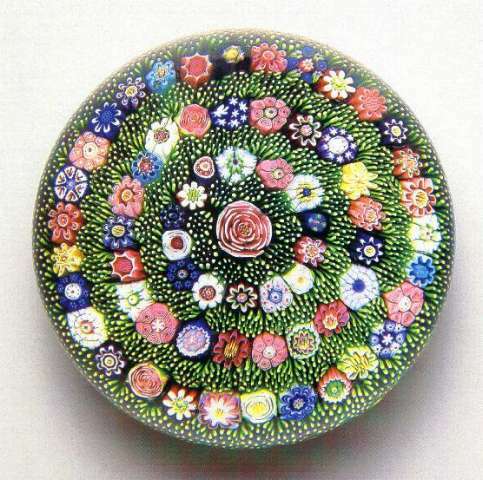 Some paperweights are also featured in closeup detail photos. The collection included an incredible selection of very high quality weights. Only ten lots had modern weights, the remainder were French and American antiques (Baccarat, Clichy, St. Louis, Pantin, Boston and Sandwich, and New England Glass Company). This was a very strong auction with high prices for investment quality paperweights and no bargain lots. Even the paperweight books brought strong prices. 8 1/4" by 10 3/4". Soft bound.